People across Scotland are being invited to join a conversation about community decision-making to help make public services more locally focused. The Democracy Matters conversation will identify new legal rights for communities which would place them at the heart of decision-making. As part of the conversation people are being invited to consider a short set of questions on shaping local democracy. Community groups can also apply for grants of up to £300 to host their own events related to the project. The start of the Democracy Matters conversation is an important moment for community decision-making in Scotland. We believe that more decisions about public services should be taken locally, and that communities should be able to influence those decisions. We want to hear from people across Scotland about the issues they want decisions on in their neighbourhood, town or village, and the kind of arrangements that would help that happen. Across the country, it is widely recognised that Scotland needs local solutions to the opportunities and challenges it faces. The conversation is a vital contribution to the change that is needed across all spheres of government to make Scotland a more democratic place, and to ensure that Scotland’s public services are built around the communities they serve. As things stand, communities often find that the really important issues that affect them the most are decided without their involvement and in faraway places. But if democracy is working well, most of those decisions would be taken much closer to these communities and often by local people themselves. Democracy Matters is a rare opportunity for communities everywhere – especially for those groups whose voice doesn’t always get heard – to become involved and to re-imagine how democracy can be made to work for everyone. 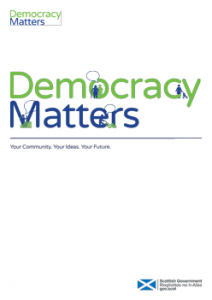 The Democracy Matters conversation is a joint venture between the Scottish Government, COSLA and the community sector and will run over the next six months.